The purpose of every baccarat system is to improve a player's chances for winning and give him/her a particular scheme of how to play, when and what bet to make and how much money to bet. A baccarat system makes it easier for a gambler to play baccarat, saves his/her time for making a decision of what option to bet on, and it makes a player to be more confident and feel him/herself better at baccarat table. 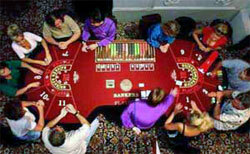 However, not all baccarat experts believe that all these systems really work: there is no particular baccarat system which would definitely be a winning one for baccarat game. Anyway, they have a right to exist, and they are used by many gamblers who win real money thanks to these systems. Let's have a look at the most popular of them. This is a positive progression system which works in a following way: you double your bet every time you win and back to your initial bet if you lose. For example: your initial bet is $2. You win - your next bet will be $4; you win again - your next bet is $8. You lose - you come back to your initial bet - $2. As well as Paroli, Parlay system is also a positive progression one: if you win you add your winning to your initial bet. For example: your bet is $2. You win - add another $2 and bet $4. Win again? Add another $4 to your initial bet. If you lose - you come back to your initial bet of $2. This baccarat system is very popular among players and it is a negative progression one: you double your bet every time you lose. When you win - you come back to your initial bet. For example: your initial bet is $2. You lose - you double your bet and now it is $4. You lose again and bet $8 them. If you win - you return to your first bet and place $2 again. Certainly, this list of baccarat systems is not full, and it is possible to find much more of them: D'Alembert System or Labouchere System for example. Anyway, it is up to you which one to use of whether to use them at all. They are risky somewhere, each of them has its pros and cons; anyway, they have a lot of admirers who use them and find them to be rather effective indeed.